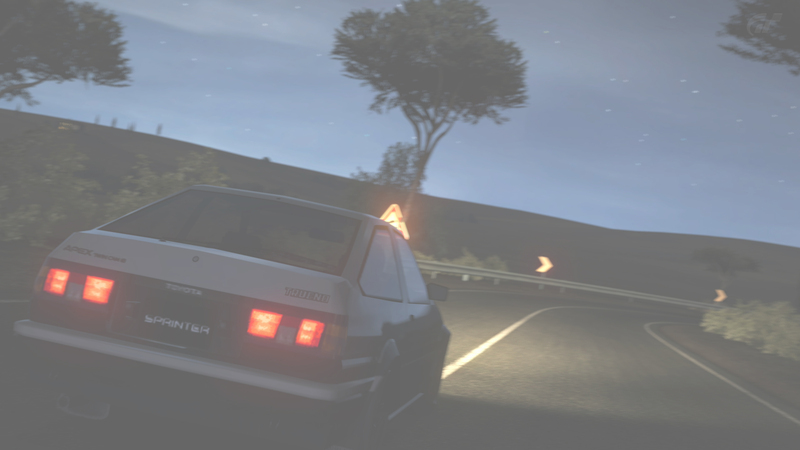 The AE86 will always have a tendency to oversteer because of its old design. Also the fattest tires you can install are mere 225s (same problem with the FC3S). The good thing about the 86 is its insane acceleration (like what 7.2-7.4 in B-class right?) so when driving it you have to maximize its strengths (exit speed, straights (ironic right? ), and nimble body) while keeping its faults at bay (skinny tires which result in: a tendency to oversteer, relatively lower cornering speed, relatively bad braking). All in all, just practice with it enough and keeping the 86 under control will become second nature. Thanks for the time u have taken on giving me this advice it ok to add u on xbl? So hour after hour of trying to get a clean 4:50... I've given up for now. 4:51.083 dirty is what I ended up with. Trying to be fast and not go dirty is terrible. Idk how ya'll do it. The FC is starting to feel in well though. Oh yeah, I remember now. We should be running pretty even times at this point, might be a fun race. Dang, a 4:36... I've barely driven the new/old downhill too. I'm gonna need practice. What stage is that time for again? That one and the 4:37. Yep, everyone mostly sticks to the New Downhill. Don't let that keep you from the other stages though, they're all important. I'm not going for #1 because that's not possible, but I do want to get a good time. 4:50 would be the first goal, breaking into the 40s is the most important, there is alot of competition there and most of the touge community run somewhere in the 40s. There are fewer and fewer as you get closer to 4:40. Anything below 4:40 is amazing. Many of the known teams on the touge scene have a few members running under 4:40. New Down Hill is normally run in friendly battles and for Hot laps, but for Comps and Time Trials it's normally either B reverse or A reverse. Like MiNd said. Just set goals for yourself. I used to run 5:15's in my MX-5 when I first started, now I run about 4:38 on average because of the goals I set. I'm gonna need to learn the lines and dial in my tune. It's gonna be a whole before I'm there haha. Thanks man. Ive put the info on my 86 up on here, does anyone have any suggestions on how to make it corner better? I'm no AE86 expert or anything, so take this with a grain of salt, but I would try increasing your brake pressure as well as biasing it towards the rear. I'd try around 110% pressure and 49-48% balance to start with. Also keep in mind that an 86 will never really corner well. Your going to be walking a fine line every time you corner. Just concentrate on maximizing exit speed and try not to thrash it too much and you should get faster. My brother might be able to give you some more tuning tips, i'm sure he'll post here if he has anything for you. I think he asked for feedback lol. I'm not sure he wanted that up there.